Over the years, JK floorheating installed in-ground Low Temperature Heating (LTH) systems in almost every type of floor construction there is. With this level of experience we are comfortable referring to ourselves as experts in this field – experts who are happy to help. A house generally has a screed or floating screed which is made of sand-cement or a cast floor in which calcium sulphate (anhydrite) is used as a binder. These screeds are plainly suitable to install the in-ground underfloor heating system. Besides this conventional floor constructions are concrete and dry-construction floor constructions also suitable for in-ground underfloor heating systems. In cooperation with leading companies, we have developed dry construction floor systems for the renovation market, such as gypsum-based panels, XPS and Sandwich panels. All of the systems we install are quality approved by accredited laboratories. The dry-construction panels can be laid upon a timber subfloor where the in-ground underfloor systems can installed in. 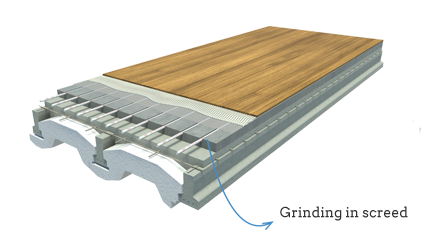 The acoustic and insulation characteristics of such panels are additional benefits of using this solution on your timber subfloor. Would you like to find out how much it will cost? The demands on modern building materials are increasing and becoming more and more diverse. The market is dominated by fast, high-quality solutions that meet or even exceed all current safety regulations and energy efficiency requirements. Construction work needs to be completed effi.ciently in short time frames, without unnecessarily long drying times and without creating too much dirt. These requirements are met by using easy-to-handle products and time-saving processes and installation techniques. Fermacell is a universa! material which can be used as a straightforward building board, for fire protection purposes and in rooms where resistance to moisture is required. Fermacell outperforms traditional dry-lining where other systems need multiple layers and separated studs to achieve similar impact, acoustic and fi.re ratings. Fermacell gypsum fi.bre boards have been developed to the highest standards of German engineering. The boards have a simple homogeneous composition - recycled gypsum, cellulose fi.bres from post-consumer waste paper, water and no added chemicals. 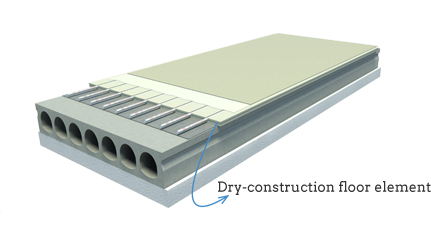 Fermacell boards are fi.bre-reinforced throughout and are therefore extremely resilient and have particularly good sound-proofi.ng properties. Fermacell gypsum flooring systems are designed for use as floating floors in a wide variety of applications. They are manufactured using the same technology as the high-performance Fermacell gypsum fi.breboards. Fermacell flooring is supplied in the form of two layers of 12.5 [mm], with a 50 [mm] overlap (shiplap). The overlap gives a wide fi.xing edge around the perimeter for easy jointing. The Fermacell boards are routed on site and the JK Flextube is then laid into the routed grooves. The JK Flextube is an oxygen-proof Poly-Ethylene or Raised Temperature resistant (PE-RT) pipe that complies with the German DIN 4726/4721, KIWA KOMO and the BRL 5602 standards for use in underfloor heating/cooling systems. solution unique, cost effective, sustainable and very efficient. Key features of Fermacell’s flooring system are improvements in airborne and impact sound and thermal performance. The system is also resistant to fire, rot and vermin, it’s ideal for uneven floors and it’s easy to install. Key features of JK’s in-ground UFH system are health and safety benefits, eco-friendliness, comfortable, practical and aesthetic. An additional benefit is that the UFH system is installed by fullytrainedJK engineers.